Antique Ando HIROSHIGE Japanese Woodblock "MISHIMA" 53 Stations of Tokaido Print. Antique Japanese woodblock print by Ando (or Utagawa, Ichiyūsai, ) Hiroshige (1797-1858). Woodblock is titled “Mishima: Morning Mist”, and was from the series Fifty-Three Stations of the Tokaido Road (also known as the First Tôkaidô or Great Tôkaidô). Mishima is the 11th rest station along the Tokaido Road. 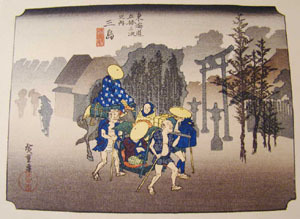 Originally published by Hiroshige in 1833. Believe this one is a re-published series produced in the early 1900s from recarved woodblocks? Publisher: Takenouchi Magohachi , Takemago, Hoeidö. Overall washi size is 8-1/2" x 6-3/4". Overall printed area is 7-1/4" x 5-3/8". It is in very nice condition with no tears, stains or creases. Nice details, signatures, vivid multi-layered coloring. Comes from a fine estate and is ready to be framed and displayed. Antique THOMAS SULLY Orig Framed Lithograph 1899 Boy THE TORN HAT Detroit Publishing Co. 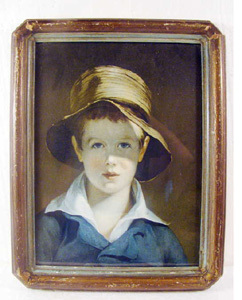 This is an amazing antique lithograph of a boy in "The Torn Hat" by Thomas Sully (1783-1872). Sully, an American portrait painter, was born in Lincolnshire, England, came to American at the young age, living most of his life in Philadelphia. He is known today as one of Philadelphia's leading portraitist for the early nineteenth century. His works featured some of the most influential people of his time. Presidents, Queens, leading musicians, composers. This work features Thomas's nine-year old son, Thomas Wilcocks Sully. Wearing an open shirt, rumpled jacket and a straw hat with a torn brim. This work was published in the late 1800's to the early 1900's by the Detroit Publishing Company. It is marked in the lower right "Copyright Detroit Publishing Company, 65008" It is not a typical antique print as it was done with a unique printing technique known as chromolithography. In using this process the publisher has managed to capture the boy's true haunting quality that was the essence of the original painting. 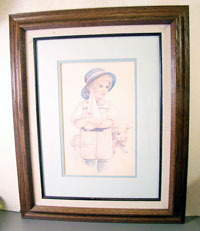 It portrays well in its original now 'shabby chic' looking frame, behind glass. The print has excellent coloring still with no visible stains, tears or damage. Original paper backing is long gone. Framer's label is now viewable on back, "H. Leiber Company, Indiana". The lithograph measures 10" x 13". Overall frame size is 12-1/4" x 16". Although the frame is scarred, chipped, finish worn it could be restored if a more refined look is required. For those of us who can never hope to acquire an original painting by Thomas, its a joy to come across an scarce original antique chromolithograph of one of his works. Antique Etching EDITH WILLSON Pair Fox Terriers Authentic 1920's artist etching by the renown listed artist Edith Derry Willson. Title: "Stuff and TTonseice"? Size: 8-1/2" x 10-3/4". Pencil signed by the artist on the bottom right, title is bottom left. This wonderful work of art is orignal, matted, framed, behind glass. The artwork and frame is in very nice condition still overall, with no signs of abuse (tears, stains, holes). Paper backing is tattered and worn around the edges. 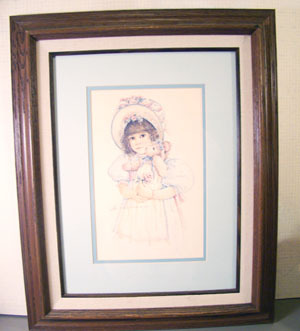 The overall size of the frame is 15-1/2" x 18". There is some lite wear to the finish on the wood frame. 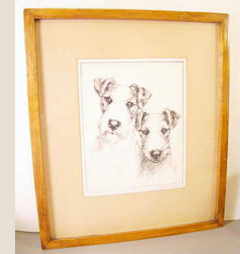 If you love Fox Terriers or know someone who does this would make a unique, lasting impression gift. 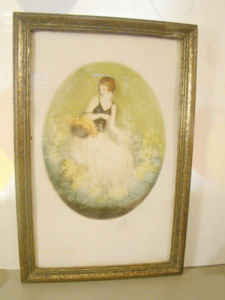 Art Deco NICOL Etching LADY Icart Boudoir Style Framed Fresh from an estate attic. Antique framed aquatint etching. Signed in pencil "Nicol". Oval etching of pretty young lady gathering flowers in her basket, with plate mark around the edge. Frame measures 17-3/4" x 11-3/4". 10-1/2" x 8" on the oval etching area. There does not appear to be any blind stamp, or watermark, but I have not opened this up to see it first hand. The paper appears to be wove with lite texture. There does not appear to be any tears or holes and the coloring is still quite vivid and bright and does not appear to have been subjected to sunlight when displayed. There is no foxing. There is some stains on the border and some on her dress area. I've shown several pictures so you can see the quality and its condition. I've cleaned the front glass, but it really needs to be opened up and cleaned and have the old dingy cardboard backing replaced. I'll leave that to you. Long 1919 Indian Maiden Art Deco Framed Print! 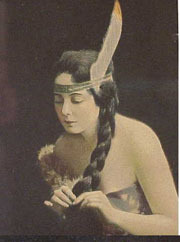 Lovely antique calendar top print of an indian maiden named Minnehaha. Its marked Minnehaha, #20130, ©1919, Brown & Bigalow, St. Paul Minn, and Sault Ste Marie Ont. Print is framed behind glass and I did not open it up to see if there is advertising on the back. It is as found in an estate. The print itself is 18-1/2" long x 6-1/4". Overall dims of the frame 10-3/4" x 22-3/4". Print appears to be in very nice condition overall. There is three tiny holes under her name where the calendar pad was originally attached. The prints coloring is still vivid and unfaded, and it does not appear to have any stains. There is some light staining on the outer mat and some flakes of dust. The frame and original glass is solid and intact. The paper backing is torn on the top in back. A stunning addition to any collection. 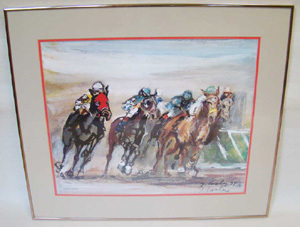 RARE Ltd Ed PRINT Signed JACK COOLEY 1974 Churchill Downs! Fresh from a fine estate and offered for auction is this gorgeous limited edition expressionist print by the listed artist, Jack Cooley (1923-2008). Jack was a well known African-American artist, who settled and began his artistic career in New Orleans back in the 1950's. This print was produced in 1974 and is dated, signed and #'d. It depicts racing jockeys on horseback as they round the corner at the track. The track is not named and could be Churchill Downs, or more likely a depiction of one of the horse racing tracks in the New Orleans area since Jack was known for creating works of art that depicted the many varied aspects of his adopted city. Print is numbered 638 of 1000, and has both the printed signature and the artists signature. This amazing print was custom framed by the Collectors Gallery in Lexington, Kentucky years ago. Print features a complimentary brushed gold metal frame, with orange and tan matting. Overall measurements 24-1/4" x 28". Site is 17-1/4" x 21-1/4". Jack was an icon of New Orleans and his artwork is widely collected. The print, glass and frame are in very nice condition. It would make a stunning addition to any collection. Professional packaging for safe arrival. 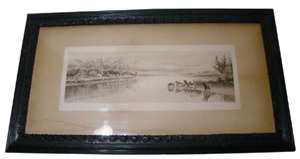 Authentic 1920's artist proof etching by the renown listed artist Bert Cobb. Title: Luchs, Portrait of a German Shepherd. Size: 14-1/2" x 11-1/2". 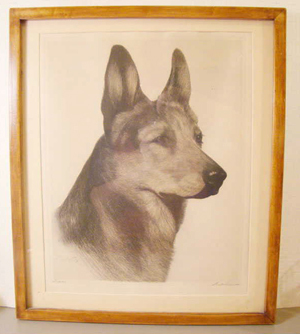 Pencil signed by the artist on the bottom right, title is bottom left, and inscribed signature on the etching below the dogs neck. Excluded from the numbering as it was an A.P. This wonderful work of art is original as exhibited, matted, framed, behind glass, paper backing sealed still with Gallery label on back. The work was offered for exhibition by Bert Cobb at the C. W. Kraushaar Art Galleries in the early 1930's. Documentation label on the back reads: from: C.W. Kraushaar Art Galleries, 680 Fifth Avenue, between 4th and 5th Streets, NEW YORK, Established in 1885, "LUCHS", A.P. ETCHING by BERT COBB. This artist proof was printed especially for Bert Cobb and was part of his personal collection. It was one of the first printings pulled off of the fresh "stone" and given to the artist for him to determine the plate finished and ready for production. It would have been one the sharpest and most vivid of any that was produced. The artwork and frame is in very nice condition still overall, with no signs of abuse (tears, stains, holes). There is a small spot by the dog's ear and two more (lighter) lines on the background that appear to be a slight scuff to the paper? On the whole the artwork and matt have a aged (yellowed ) appearance. 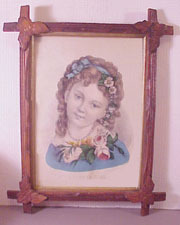 The overall size of the frame is 15" x 17-1/2". There is some lite scratches to the glass from storage. Original A.P. etchings by Bert Cobb are not offered often. Past gallery offerings and quality auction house results show values of his following run etchings (not artists proofs) valued at $800. to $1400. No results were found for A.P.'s. 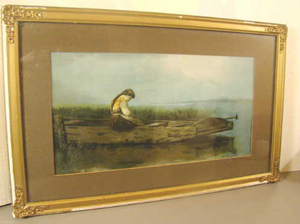 This is a beautiful old lithograph of a lone girl in a boat. All original, matted behind glass, in its original frame. There in no signature viewable but maybe one under the matting? The print is in excellant condtiion with no holes, stains or visible tears. Its coloring is vivid and unfaded. Produced in the late 1800's and is an authentic print. It measures 19-1/4" x 12" overall on the frame. Visible print size is approx 14" x 7-1/2". The gilted wood frame has some rubs and flakes and one of the ornate golden metal clasps on the corner has broken through in the cener and is just laying in place. The paper backing is long gone. Wire hanger still attached. Take a look. It is a fine quality lithograph and with some restoration or replacement of the frame it would be a lovely addition to any collection. SEALED!! 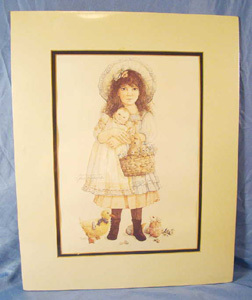 Vintage 1982 JAN HAGARA SGND Lithograph Victoria Girl w/Doll 14x10"! Vintage 1982 Jan Hagara Lithograph. This little girls name is Victoria. Shes carrying her baby doll and a basket with a bunny rabbit and daisy like flowers. At her feet are some toys, wind up duck, marbles, another rabbit. Cream colored matte, brown accent. Name, signature, and dated on the litho. Completely sealed in plastic as originally issued. On the back inside the plastic is an "Affidavit of Limited Edition,This lithograph has been inspected for quality by the artist and verified by her signature. No other edition will be publihed. Typed:_1000_ Jan Hagara Artist". Overall size: 16" x 20". Size of print showing: 10" x 14". Condition: Sealed, never opened. Thank you for stopping by and I look forward to having you as a new customer Bid with confidence! Jan Hagara Signed, Limited Edition, Professionally Framed Print! This is Brandon. An adorable little victorian era boy holding his sailboat, and his pet lamb standing behind him. Certificate of Authenticity on the back. Says "The Jan Hagara Collectors' Club certifies that this fine art print is from an original Jan Hagara watercolor design to be produced only for the Club Menbership. It is numbered 1040. Copyright 1990, The B&J Company. Frame is 21-1/4" x 17-1/4". Teal blue mat. Excellant condition. Jan Hagara Professionally Framed Lithograph! This is Victoria, an adorable victorian era little girl.. She is holding her baby doll, and is carrying a basket with a bunny. There is a bunny and a duck on the ground. Produced in 1982. Signed, and dated on the lithograph and on the Affidavit of LImited Edition on the back. Sealed in its original wrap. Excellant condition. Never opened or displayed. Cardboard backing measures 20-1/4" x 16-1/4".